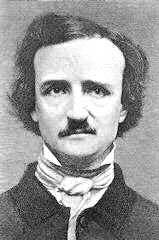 Edgar Allan Poe was an American short-story writer, poet, critic, and pioneer of the mystery and science fiction genres. His The Unparalleled Adventure of One Hans Pfaal (1835) ranks among the first scientifically serious tales of spaceflight and had a powerful influence on future writings on this subject. His description of Earth as seen from space is surprisingly accurate and his sealed gondola-ship reminiscent of stratospheric balloons of the 1930s. It is no coincidence that one of his university teachers was Joseph Tucker. Poe is probably best known for his stories of the macabre. But, with the publication of "The Murders in the Rue Morgue" (1841), he also became the father of the modern detective story. Poe's poem "The Raven" (1845) ranks as one of the most widely read poems in American literature. Among his better-known short stories are: "The Gold Bug" and "The Masque of the Red Death" (1842), "The Pit and the Pendulum" and "The Tell-Tale Heart" (1843), "The Premature Burial" (1844), and "The Cask of Amontillado" (1846). His novel The Fall of the House of Usher (1842) also sets a standard for macabre fiction. Poe, who is known to have drunk heavily and used drugs, died ignominiously in a ditch in Baltimore, Maryland, after a heavy drinking spree. 1. Poe, Edgar Allan. "The Unparalleled Adventure of One Hans Pfaal." In Works of Edgar Allen Poe, edited by J. H. Ingram. Edinburgh: A. & C. Black, 1875.